Boston is under construction, with new business, restaurants and hotels adding to the city’s historic architecture. Now known as the Seaport District, it’s the fastest-growing neighborhood in the city. GE, PwC and Reebok set up shop here. Luxury condominiums are the priciest in town. New boutique hotels like The Envoy Hotel are opening, and established destinations, such as the luxurious Boston Harbor Hotel, have undergone renovations. New restaurants, including the modern seafood eatery Lola 42, have garnered good reviews, and the party never stops at waterfront watering holes such as Legal Harborside and Lookout Rooftop. With cranes towering over the entire scene, there’s more of everything to come. So if you’re attending a conference at the Boston Convention and Exhibition Center or Seaport World Trade Center, both located here, you’ll have plenty of new places to stay, eat, drink and shop over the years to come. 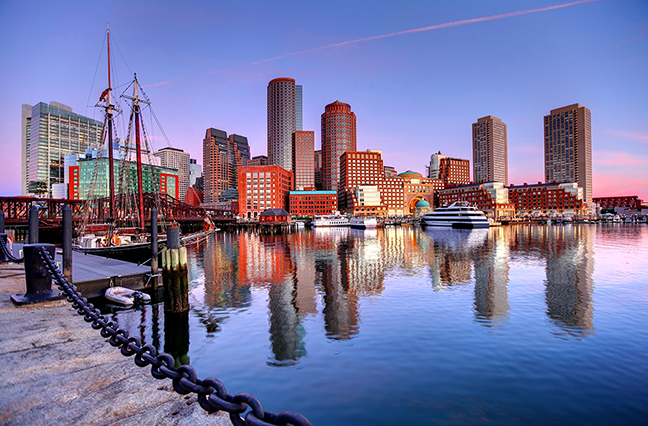 Yet despite the harbor setting, with all of the shiny new skyscrapers and contemporary architecture, it doesn’t feel a lot like Boston, one of America’s most historic cities. If you want to soak up history when you walk down the street, stay at a place near Boston Common, the beginning of the Freedom Trail or close to the Federal-style row houses lining the narrow streets of Beacon Hill. Even in Boston’s oldest neighborhoods, hotels have been reinventing themselves, and new restaurants are popping up. The classic-meets-modern mash-up is giving buttoned-up Boston a new vibe. The Ritz-Carlton Boston Common, one of the city’s most luxurious hotels, and Nine Zero, one of the first design-forward hotels, have undergone multimillion-dollar renovations. Both redesigns reflect a modern colonial design aesthetic, using traditional materials—wood, metals and leather—in contemporary interpretations of the furnishings and décor. While Boston’s dining scene hasn’t received the acclaim of cities like New York and San Francisco, there are restaurants here that can compete anywhere. In 1998, self-taught chef Barbara Lynch raised Boston’s culinary profile when Bon Appetit named her first restaurant, No. 9 Park in Beacon Hill, one of the “Top 25 New Restaurants in America.” Twenty years later, Lynch has compiled eight restaurants in her BL Gruppo hospitality empire, as well as Stir, a demonstration kitchen and cookbook store, and three James Beard awards. Many of Boston’s rising-star chefs and hospitality industry professionals have honed their skills under her guidance. One, Colin Lynch (no relation), opened his coastal Italian eatery, Bar Mezzana, in the South End in 2016. It has become one of the hottest restaurants in town.